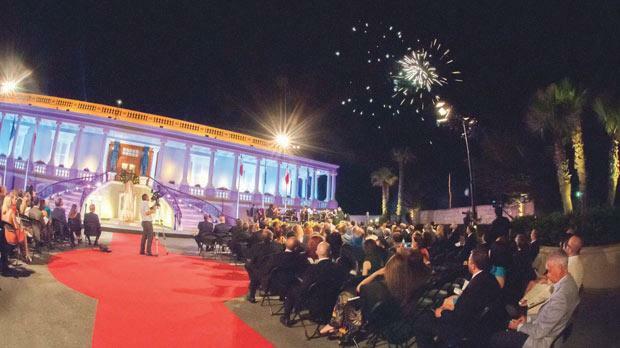 A concert and reception was held as part of the festivities to celebrate the 50th anniversary of the Dragonara Casino, St Julian’s. The Dragonara Casino opened its doors on July 15, 1964, in what was considered as one of the first major projects to establish Malta as a tourist destination. Dragonara Gaming Ltd, a fully-owned Maltese company, took over the helm of the casino in June 2010. Since 2010 the company has invested over €15 million in refurbishment works and product upgrades. The Dragonara Casino attracts over 1,000 patrons a day, enjoys a 50 per cent market share and has a staff complement of 200. Schembri unveiled a new investment programme which will see the company invest in a multi-million-euro extension, development and restoration of the Dragonara peninsula. The plan includes the restoration of the palace, the surrounding fortifications and main gate, the embellishment and landscaping of the surrounding grounds including the main avenue, and the reconstruction of some architectural features that have been lost over the years. The project will involve the reconstruction of the building at the northern tip of the peninsula known as Dragonara Point. This will accommodate an international poker venue capable of attracting international renowned brands to Malta, a casino extension aimed to develop the private gaming niche and a Sports book. There will be private suites for international high rollers and a club run by a top international franchise. An underground facility of 250 parking slots will complement the project. Economy minister Chris Cardona said the new investment project planned is a declaration of confidence in Malta, its people, its business potential and future success. “Establishments such as the Dragonara Casino and others operating in the tourism sector have a very important role in enhancing the economic growth and economic stability of our country,” said Cardona. At the end of the event he unveiled the restored statute of the Marquis Emmanuele Scicluna (1820-1886), a symbolic gesture to mark a new era for the Dragonara Casino, wherein the historic value of the past is intertwined with the prospects of the future.